Bar Top Epoxy Resin - Liquid Glass Coating. Best Bar Epoxy!! Home of the Original Bar Top Epoxy. Sold to the Trade for Over 30 Years. Now available to Homeowners Direct. It's simple DIY Do It Yourself. Our new and improved 2018 liquid glass Bar Top commercial grade bar top epoxy resin is designed for bar tops in extremely high traffic areas such as experienced by bars , night clubs and restaurants. Our crystal-clear bar top epoxy is about 25% harder than our regular grade, contains a non-yellowing agent and forms a beautiful, tough, hard, durable finish that's water, alcohol and scratch resistant. Just perfect for table and home bar tops plus all the other applications of our regular epoxy resin above. It is ideal for embedding mementos such as coins, photos or other memorabilia. Can easily be built up to a depth of 1" thick (or more) if desired. Each kit contains equal amounts of resin and hardener to make the final bar top epoxy mix. (Approximate coverage - 30 +/- square feet per gallon) at 1/16 inch. One coat is all you need for a parfact bar top coating. Our Liquid Glass Bar Top Epoxy Resin product is designed for bar tops but also has many other uses including: table tops, kitchen counters and bathroom vanities. In extremely high traffic areas such as experienced by Home bars, Casino bars, Hotel bars, Motel bars, Night Club bars, Bowling Alley bars,Pool Hall bars,VFW Bars,Private Club bars, Sports bars and Restaurant bars, any type of bar top our bar top epoxy is common place. Our crystal-clear bar top epoxy resin contains a non-yellowing agent with a uv protection and forms a beautiful, tough, hard, durable finish that's water, alcohol and scratch resistant. Our bar top epoxy is a superior Mirror Coat Epoxy High and Quality Bartop Coating. Our Bar Top Epoxy is a ultra clear epoxy that provides a clear, hard, glass-like surface on wood or concrete bar tops, table tops and counter tops. There are several scales of durometer, used for materials with different properties. The two most common scales, using slightly different measurement systems, are the ASTM D2240 type A and type D scales. The the D scale is for harder ones. However, the ASTM D2240-00 testing standard calls for a total of 12 scales, depending on the intended use; types A, B, C, D, DO, E, M, O, OO, OOO, OOO-S, and R. Each scale results in a value between 0 and 100, with higher values indicating a harder material. Liquid Glass Bar Top Epoxy uses the Shore D scale. 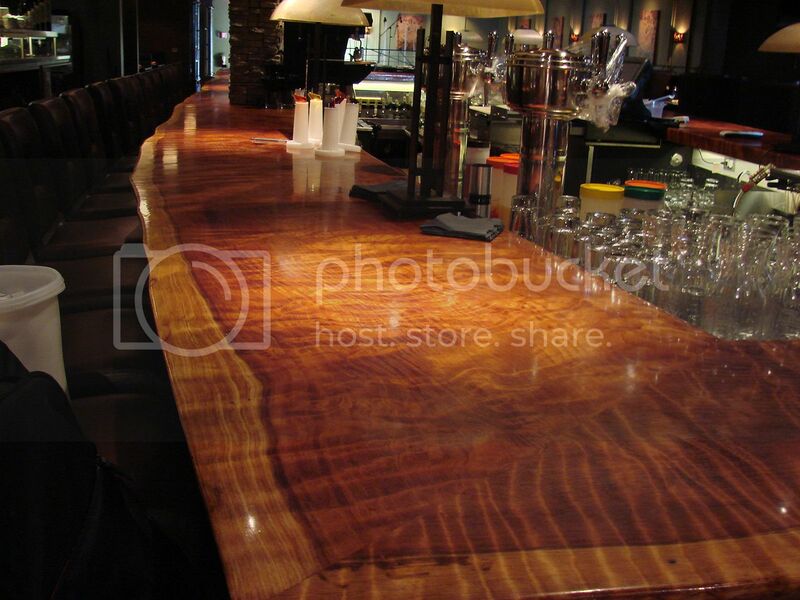 Our bar top epoxy is used Nationally by restaurants, hotels, casinos, bars, pubs, and night clubs Liquid GlassBar Top Epoxy Resin will provide your club, bar, lounge, casino, or hotel, sports bars with a long lasting table or bar finish. It works well on many surfaces such as wood, ceramics, plaster, masonry, concrete Liquid Glass bar top epoxy resin forms a glossy, hard surface which is resistant to stains. Liquid glass bar top epoxy is the best bar top material and a favorate restaurant table top epoxy. For interior surfaces & commercial use only. Do not use outside. gloves, should be worn while handling this compound. If POLYMER accidentally comes in contact with skin, wash affected areas with soap and water immediately. AVOID INHAL-ATION – Use in well ventilated areas. The compound left in mixing cup more than 2 minutes will cause heat. Resin contains epoxy bisphenol, a resin. Hardener contains a polyamine curing agent. Polymer should be used only by adults or under close supervision by an adult. KEEP OUT OF REACH OF CHILDREN. WARNING – Before starting on your project, we strongly suggest you do a test piece to help you become familiar with this type of product, and for you to decide whether this will be the right product for the type of project you are doing. We do not recommend using THIS PRODUCT on “Fine Furniture.” Liquid Glass Epoxy Resin - Sets up in about 4 hours and is cured to touch in 24 hours. One coat is usually all that is needed to capture a glossy shine. Two or more coats may be applied without damaging the first coat. Liquid Glass Epoxy Resin is recommended for interior use only. STORAGE – The epoxy should be stored in a dry place between 75ºF to 80ºF and out of the reach of children. Resin and hardener should not be left in an open container. Liquid Glass Epoxy Resin should be used in a room where the humidity is under 60%. This product should be used within one year of purchase. TOOLS – Mixing containers – should have a smooth, flat bottom and be clean and dust free. Stick – Must have flat, straight edge to ensure thorough mixing. Brush – Sometimes a small brush is needed for coating edges of crevices. COVERAGE - Mix only the amount of Liquid Glass that you need at one time. Unused resin and hardener should be left in original containers. After pouring, you have about 20 minutes working time before the epoxy begins to harden. NOTE: Pouring over a thickness of 1/16 inch may cause excessive bubbles, yellowing, and distortions in surface. Use multiple coats to achieve desired thickness. Please subtract for losses over edge of tables and bar nose. SEAL COATS– For wood, apply 2-3 coats of a lacquer sanding sealer, sanding lightly between coats. Or Porous materials like wood require what is called a seal coat of epoxy resin in order to prevent air from escaping into the fluid. To seal coat, use the epoxy you would normally use for a flood coat. Brush a thin coat on the surface. Wait about 12 hours and then you are ready to apply the flood coat of epoxy resin. A white glue seal coat can also be used. Mix 4 parts white glue to 1 part water. Wait 4 hours before applying epoxy coating. BEFORE MIXING –Bar Top Epoxy Polymer should be used in a room where the humidity is under 60% and the temperature is at least 75º-85ºF when pouring. When the humidity is over 50% a dehumidifier should be used in the room where the pouring and curing is taking place. If you set there in bottle (bottle with white cap) in hot water for 10 minutes you will have a thinner mixture and less bubbles will appear on the object being poured. Be very careful not to get any water into epoxy! Do not heat resin bottle over 95ºF. If resin bottle has been heated, working time will be approximately 10-15 minutes. MEASURING – (Remember – make a test piece first!) Measure 1 part resin to 1 part hardener. MEASURE EXACT AMOUNT OF BOTH RESIN AND HARDENER IN SEPARATE MEASURING CUPS. DO NOT add more hardener than resin as this will cause the finished coating to remain sticky. DO NOT guess at measurements or try to estimate. DO NOT attempt to drain all of the fluid from bottles rather than measuring. NOTE: INACCURATE MEASURING WILL CAUSE EPOXY SURFACE TO REMAIN SOFT OR STICKY. INACCURATE MIXING WILL CAUSE SOFT OR STICKY “SPOTS” ON THE EPOXY SURFACE. MIXING –In a clean container, mix the measured resin and hardener. Be sure to scrape sides and bottom of cups containing resin and hardener when pouring into container to be mixed so that proportions remain even. Stir vigorously for about 2 minutes scraping sides and bottom of container to insure complete mixing. In order to insure a beautifully finished product, it is extremely important that the resin and hardener are thoroughly mixed. If bubbles appear, do not worry (see step 4). Mix only the amount you are going to use. Using your stick to scrape the sides and bottom, totally empty the first cup into the second cup. Mix for another minutes and pour immediately. Larger batches of 1 quart or more will require 3-4 minutes of mixing with a straight sides paint paddle. NOTE: When mixing large amounts of this product the longer mixing time will cut back on your working time. Also, a large amount of mixture will cure faster in its container. If resin bottle has been heated, working time will be approximately 10-15 minutes. We do not recommend mixing more than _ gallon mixture at a time. BUBBLE BREAKING !!!!! – After a few minutes, bubbles may rise to the surface. They may be broken by a) gently exhaling on bubbles through a straw until they are gone (do not inhale fumes!) or b) using a propane torch. Hold the torch about 6 to 8 inches away from surface and sweep rapidly across until bubbles disappear. You may need to go back over surface again with the torch approximately 10 minutes later. Do not torch surface too close to curing time as it may make permanent waves in surface. If there is a stubborn bubble, just pop it with a toothpick. Do not use a hair dryer as its blowing action will disrupt the surface. Bubbles can appear for up to several hours, always check back to be sure. TABLE AND BAR TOPS – Cracks, seams or areas where epoxy could leak through should be filled. Do not use silicone, use white glue which dries clear. If area is less than 1/16” wide, Liquid Glass epoxy can be used to fill in. If they are any larger, a “casting resin” must be used. Also seal cracks underneath with duct tape, or oil baseclay (so epoxy can’t flow through). Wood should be sealed with a urethane sealer, varnish or a lacquer sanding sealer. Allow to dry 24 hours before pouring the epoxy. Mix no more than _ gallon of mixture at a time. Follow above measuring and mixing directions exactly. For very large items we advise having two people work together so there will be adequate working time. Very large surfaces should be divided into sections using more than one batch of epoxy mixture. Repairs: The Bar Top Epoxy can be sanded with a fine grit 600 and buffed with a common drill and pad. WARRANTY:BECAUSE WE HAVE NO CONTROL OVER THE WORKING CONDITIONS OR METHODS, OUR LIABILITY IS LIMITED TO THE PRICE OF THIS PRODUCT. Use at Own Risk -- All sales are final no returns.